It feels like summer already! 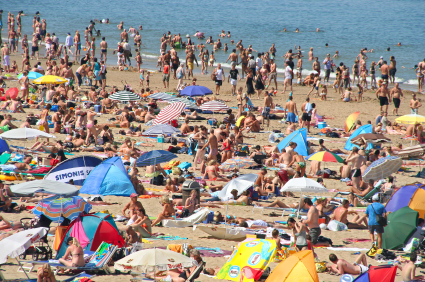 Temperatures are rising, and people everywhere are heading for the beach. So it seems fitting that May is “Skin Cancer Awareness Month.” Take some time to educate yourself about the dangers of exposure to ultraviolet (UV) light – how it can prematurely age your skin, and how prolonged exposure can lead to skin cancers of all kinds. If you are going out for a day in the sun, make sure that you apply a sunscreen with a sun protection factor (SPF) of at least 15 – and you should apply it often! Ultraviolet poses a danger to your interior environment as well. Wherever visible light enters your home – through windows and sliding glass doors – invisible ultraviolet also enters. Its effects are most often observed when drapes, furnishings, and carpeting fade. What most people don’t think about is the effect it is having on their skin at the same time! There is a way to reduce the risk of UV light to both skin and interior furnishings. Quality SolarGard® Window Films; including Panorama® and Armorcoat™, stop virtually all UV light from entering through the windows of your home or office, and protect you with an SPF of 285 and more! You can be confident that you are protecting your home, yourself, and your family when you apply Skin Cancer Foundation-recommended SolarGard® Window Film products to your windows. Solar-X of Sarasota has been helping clients protect themselves and their homes from sun and ultraviolet damage since 1973. As the area’s leading SolarGard® dealer, and exclusive supplier of premium quality Panorama® Window Films, we can help you choose the best film for your home or office needs. If you need someone to “save your skin,” contact Solar-X today for service from Bradenton and Lakewood Ranch, to Sarasota and Venice. Rated “A+” by the Better Business Bureau. UVA light causes skin to wrinkle and age. 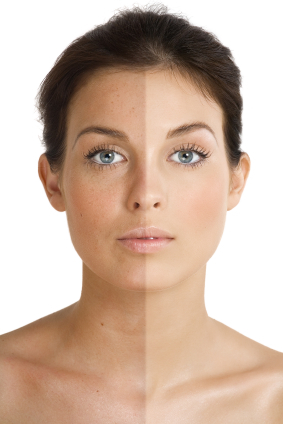 UVB causes sunburn and premature aging. Both have been linked to skin cancer. Glass may give you some protection from UVB, but not from UVA; and to be safe you need protection from both. SolarGard® and Panorama® window films offer broad spectrum protection from both UVA and UVB light with an SPF of greater than 285! That’s why they are recommended by the Skin Cancer Foundation, and an ever larger number of dermatologists. They protect you and your family from the harmful effects of ultraviolet. These high quality window films also protect your furnishings, carpets, flooring and draperies from UV fading. Since they stop up to 82% of the sun’s heat, they can keep the inside of your home cooler and more comfortable as well, and can reduce your electric bills by as much as 30%. How can you go wrong with all those benefits in one product? Solar-X of Sarasota is a proud SolarGard® and Panorama® window film dealer. Established in 1973, this award-winning company has brought comfort and protection to tens of thousands of satisfied area clients. Contact Solar-X today for a no-obligation estimate and consultation, and get a great start on this summer by knowing your family is protected from harmful ultraviolet light. Sometimes Painful. Potentially Fatal. Never Underestimate UV ‘s Dangers! May is “Ultraviolet Awareness Month;” and as residents of the “Sunshine State” we would be foolish if we weren’t aware of the dangers associated with this part of the light spectrum. UVA causes premature aging and wrinkling of your skin. UVB causes sunburn and skin cancer. UVC is the most dangerous, but thankfully; is almost entirely absorbed by the ozone layer. Ultraviolet can contribute to cataracts, Macular Degeneration, and other eyesight woes. UV destroys things through a process called “photodissociation;” which breaks down molecules in fabric and causes fading of furniture. The same process destroys tissues, causes skin cancer, and contributes to eye injuries. That’s why we wear “sun block,” sunglasses and hats when we venture outdoors for the day. It is also why people install sun control window films such as SolarGard® and Panorama®. These quality films protect your interior furnishings, drapes, carpets and flooring, and your family by stopping 99% of the harmful UV with an SPF factor of over 285+! What is the SPF factor of your sunscreen? For almost 40 years, we at Solar-X of Sarasota have been talking to clients about window film’s ability to keep homes and offices cooler, make occupants more comfortable, and reduce energy consumption. But more importantly, window film can contibute to your family’s well being by protecting them from the intrusion of UV into your home. SolarGard® and Panorama® films are recommended by the Skin Cancer Foundation for this reason. SolarGard® is once again proud to be a sponsor of this year’s “Road To Healthy Skin Tour;” an educational and cancer screening cross-country tour coming soon to a town near you. Contact Solar-X today! “A Better Environment – Inside and Out” is not just an empty slogan to us. Expect – and get – the very best, from Solar-X of Sarasota. Since 1973. 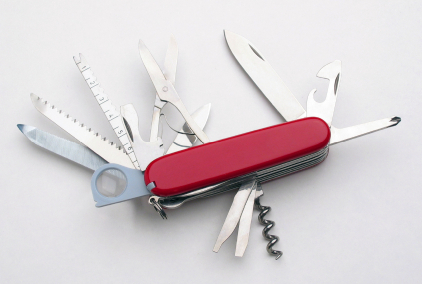 Everyone knows that when you buy a Swiss Army Knife you are buying an entire survival kit. You get a file, saw, screwdriver, toothpick, tweezers, scissors, a corkscrew and a can opener – it truly is a superb product! But you don’t need to order a seperate window film for each purpose mentioned here. Most window films do everything listed above – in one product! And that doesn’t come close to completing the list of tangible benefits derived from that one product. Window film is truly affordable when you consider its cost versus a complete window replacement – if you are concerned about the environment, think of the impact of a whole house worth of old windows in a landfill… Window film will pay for itself in short order by reducing your energy consumption and your utility bills. It is quickly and easily installed, and will improve your interior environment from the moment you say, “Goodbye” to our installation crew. Discerning home and business owners from Ellenton to Englewood know that they can trust Solar-X of Sarasota to provide them with the best products and quality installation services for their projects. We’ll help you select just the right film to maximize your “list of benefits” with just the right “eye appeal” – and at the right price. Contact Solar-X today! 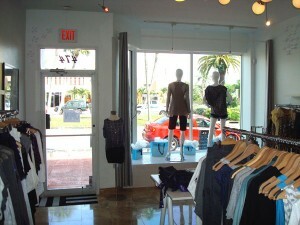 St. Armand’s Boutique Chooses Window Film For UV Protection. Few things are more devastating to a retailer than the loss of inventory due to sun fading. Expensive merchandise placed in display windows can be quickly ruined by the brutal tropic sun. Leather goods, silks and cottons; all types of goods – are sacrificed to “marketing” – and are a total loss to the store. 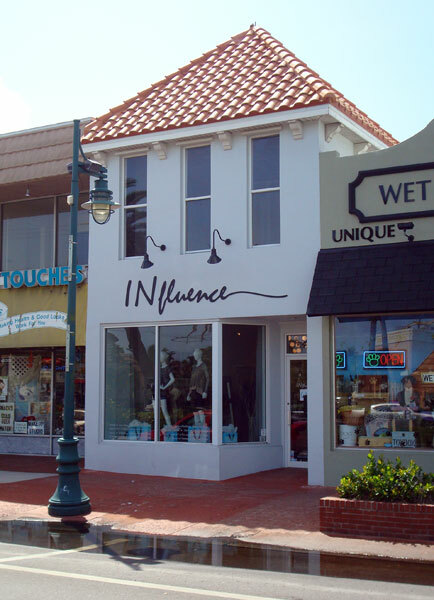 The owners of “INfluence on St. Armands” weren’t going to stand by and watch their fabulous selection of “cutting edge” designer wear destroyed by intense sun and ultraviolet light. They were searching for the best possible solution to their problem when they contacted Solar-X. Senior Sales Representative Brian Gregg was able to show them a “spectrally selective” film of exceptional clarity that would not alter the ability of window shoppers to see in, while still protecting against utlraviolet light and heat – both strong influences in damaging fabrics. The virtually undetectable color of the film allows the true colors of the clothing to be seen. Most importantly, the ability of the film to eliminate ultraviolet and reduce heat intrusion will help protect “the best selection of premium denim south of the Skyway Bridge” from irreparable damage. Count on the professionals at Solar-X of Sarasota to have the right window film products for all your needs. With nearly four decades in the window film industry, we bring an unmatched level of product knowledge to whatever project you may have in mind. Call or contact us today.